Bayou La Batre – "A ship defines the ocean"
I have no recollection of Schambeau’s advertising on TV, especially not a spot this long. It looks like the early 80s. The kids shown buying from the candy counter were probably my classmates. Schambeau’s was one of the two main grocery stores in Bayou La Batre, along with rival Greers. Schambeau’s was about a mile further from our house, but we shopped at both. Schambeau’s was more of a General Store than Greers, which was purely a Supermarket. In the last years, Crum Schambeau was heard to remark that the real competition was the Walmart in Tillman’s Corner. Schambeau’s did not long outlive Mr. Crum, due (I’m told) to his heirs not wishing to continue running the store. Greers continues. When you grow up in Bayou La Batre, there are certain things long gone that you hear about from the older residents. 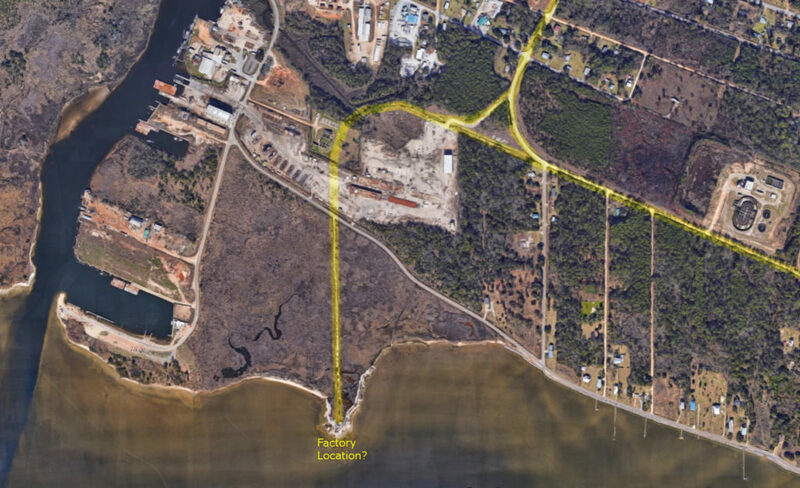 When we would drive around the shore on Shell Belt Road, my Pawpaw would point out a location where the “Old Factory” used to be. There was not even a trace of anything that looked like a building remaining. 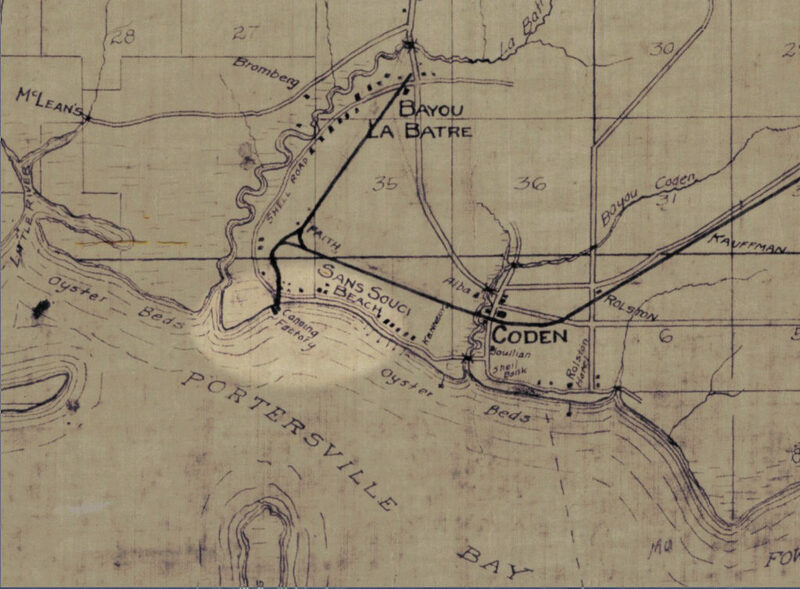 This map, dated 1918, shows a “Canning Factory” at the end of a railroad spur, located conveniently near to the “Oyster Beds”. I don’t remember anyone specifically saying that oysters were what was processed at the factory, but it would certainly make a lot of sense if it was. The railroad here was the “Bay Shore” branch of the Mobile & Ohio Railroad, which operated from approximately 1899 to 1940. There is little to show of this line today, the rails having been physically removed soon after abandonment. It is memorialized by Railroad Street in the Bayou and Bay Shore Avenue in Mobile. At the far western end of the wye at San Souci was the lead to the Alabama Canning Company, also known as the American Canning Company. 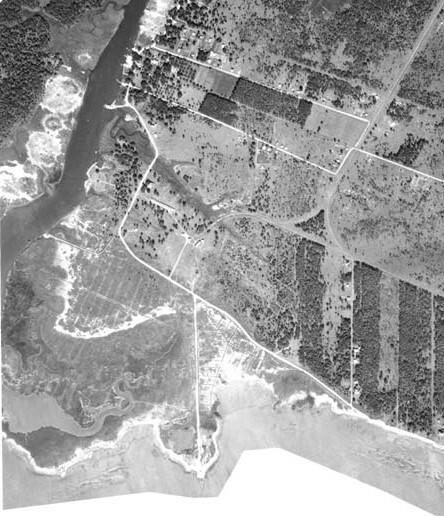 Alabama Canning Company was located on the north end of Coffee Island, about a mile south of the junction at San Souci. It was on this track that the trains would head down first, then back up through the wye toward Bayou la Batre. The 1918 map disagrees about the factory being on Coffee Island, and I’m inclined to side with the map. An island location would have required the railroad to build a mile-long trestle over the bay. This does not fit with any description of this railroad that I’ve ever heard of before, and would have been a literal “bridge to nowhere”. It seems more reasonable that the factory was located on the mainland. The real revelation happened when I began searching for more info on the “Alabama Canning Company”. It turns out there are a lot of pictures of this place, located in the National Archives and the Library of Congress! 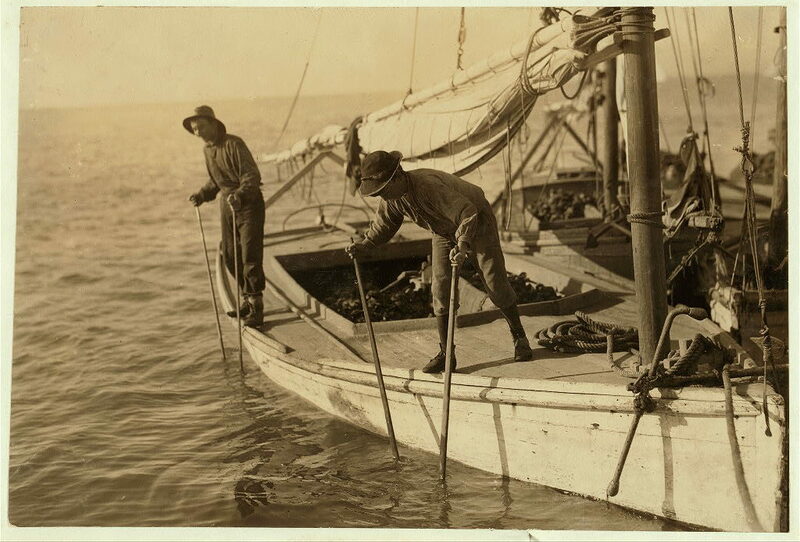 This photo shows oysters being unloaded onto the dock. It looks like they had a large pier running out into the bay, with railroad tracks utilized for wheeled oyster baskets. The factory in the background looks like a sizeable operation. It must have been the biggest industry in town at the time. Many of the photos show very young workers in the factory and on the boats. 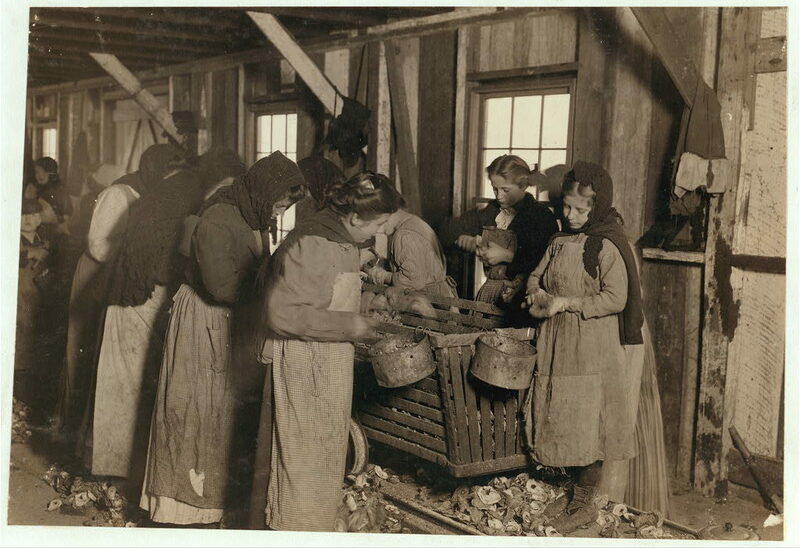 This was the early 20th century, the era of child labor. These photos were taken about 1912-1913. The children would have been born in the first decade of the 20th century. This is about the age of my great-grandparents. If you are from Bayou La Batre, some of them could be your great-grandparents, if not great-great-grandparents. 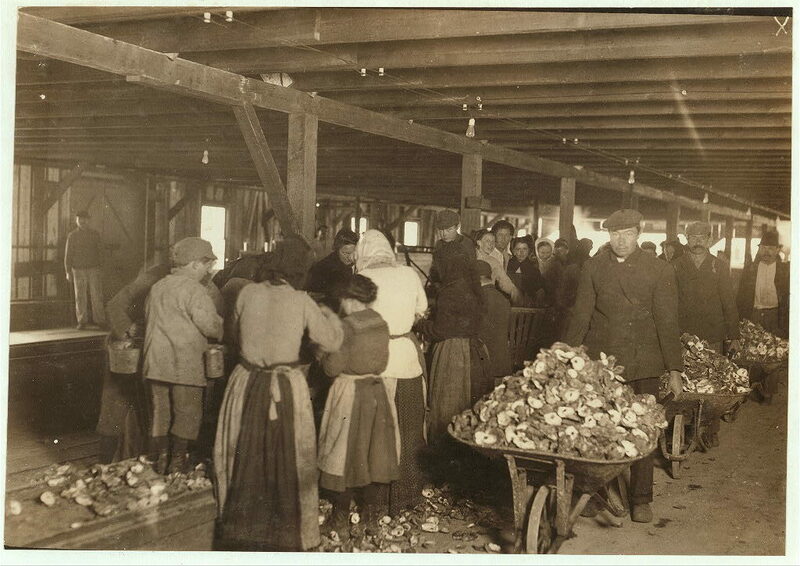 The [labor shortage] problem was resolved initially by bringing in Eastern European immigrants known as ‘Bohemians’ from the Baltimore, Maryland canneries. 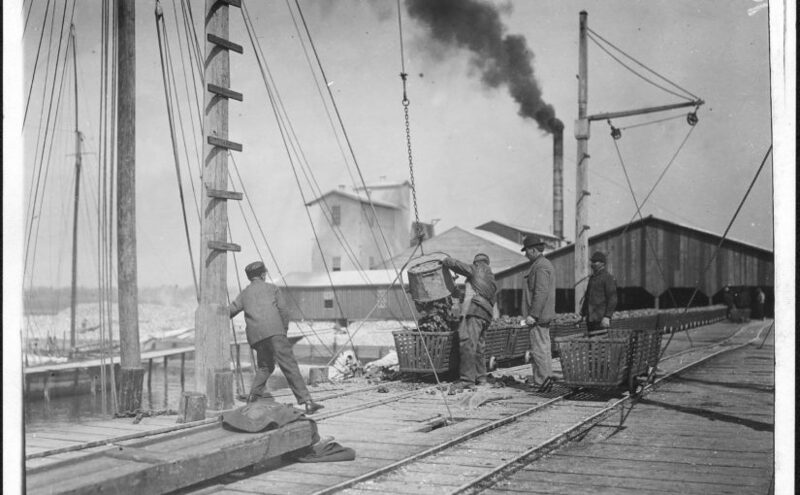 The Baltimore people traveled in special railroad cars from their homes in Baltimore to work the canneries during the winter oyster season along the coast. They lived in factory-owned camps near the canneries, and the children rarely attended local schools. Some of the Baltimore families stayed on after the oyster season. We can assume the hiring practices established in Biloxi were also followed in Bayou La Batre. 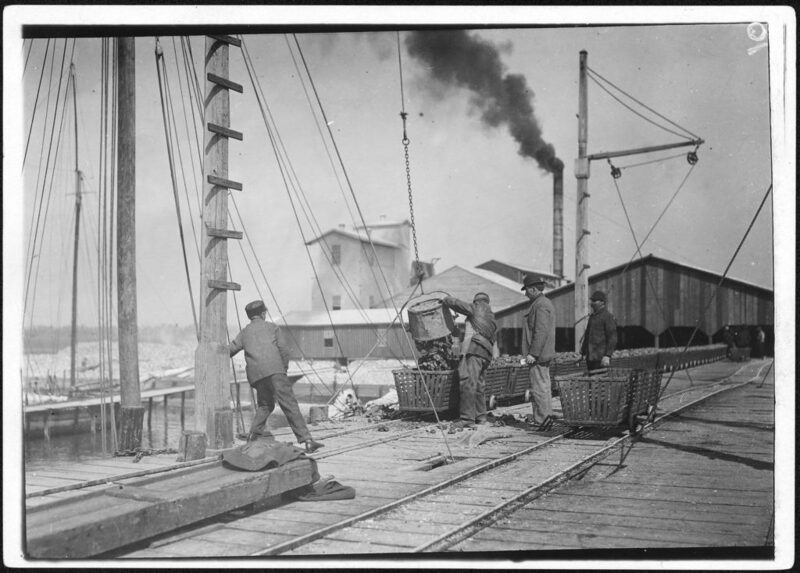 It turns out the reason all of these 100-year old pictures from Bayou La Batre are part of the national historical record, is because they were part of a famous series taken by Lewis Wickes Hine. 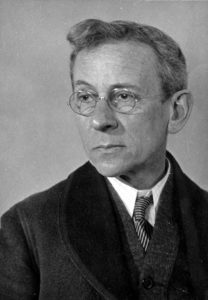 Lewis Hine is an unsung hero of American labor relations, risking his own safety to end the practice of child labor in this country. In 1908 Hine became the photographer for the National Child Labor Committee (NCLC), leaving his teaching position. 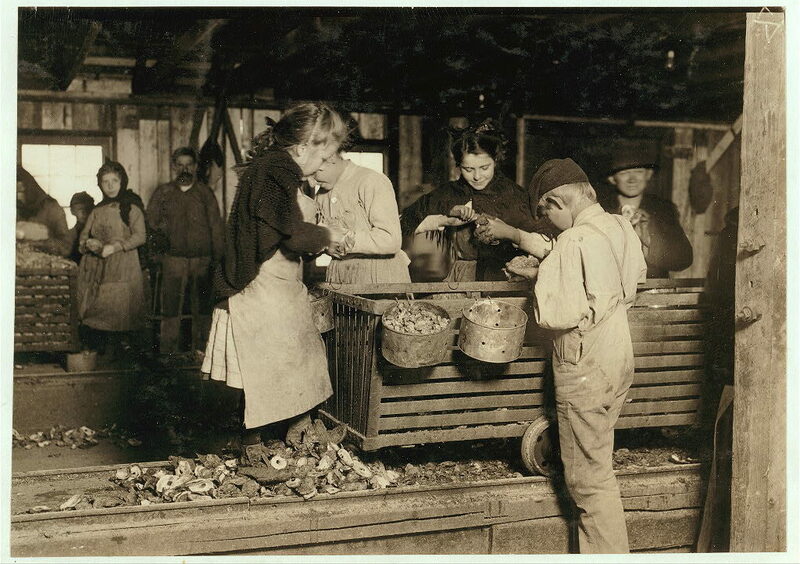 Over the next decade, Hine documented child labor, with focus on the use of child labor in the Carolina Piedmont, to aid the NCLC’s lobbying efforts to end the practice. In 1913, he documented child laborers among cotton mill workers with a series of Francis Galton‘s composite portraits. So here we have a connection to historical events of national importance, right there in Bayou La Batre, and all that’s left of it is a dirt path through the marsh grass and scattered recollections of an “Old Factory”. 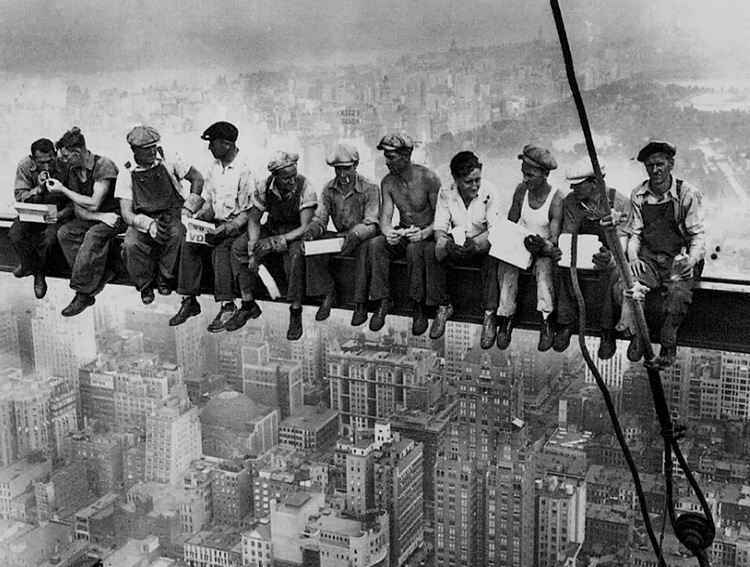 Hine is also the photographer of a very well known series on the construction of the Empire State Building. Below is a photograph taken before the hurricane of 1906, showing the company tracks on the west side of the building. The photographer is facing south, toward Portersville Bay. 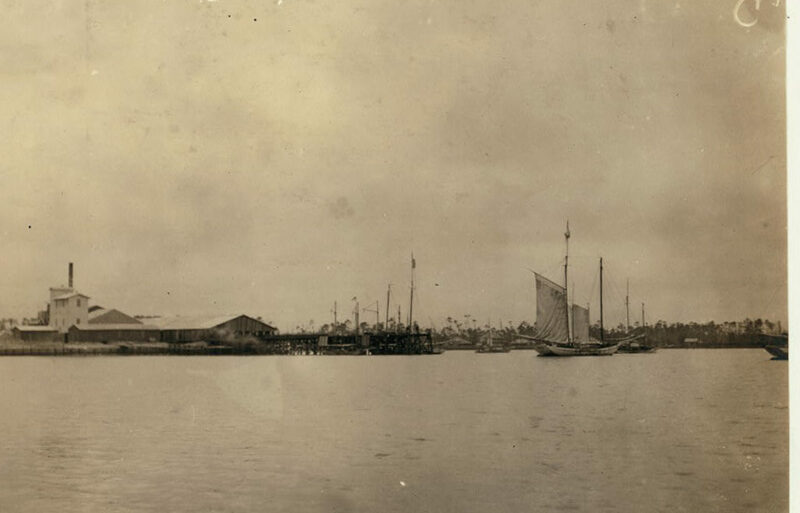 The buildings seen in this image were either heavily damaged, or destroyed, in the 1906 hurricane, and the company either elected not to rebuild, or was financially unable to. 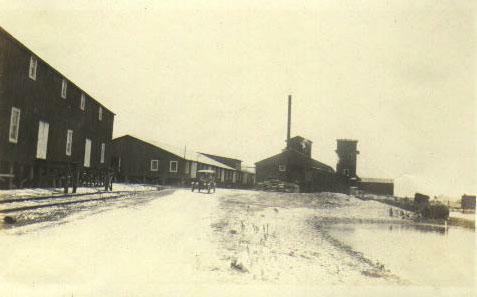 At a later date (unknown) this location became the Dunbar & Ducate Factory. Dunbar & Ducate was later destroyed by a boiler explosion which claimed the lives of several employees. 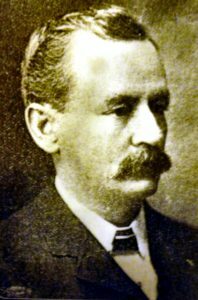 “Dunbar & Ducate”, (or DuKate) had already taken over by the time of Hines’ photos in 1912-1913 (and indeed some of his captions refer to it as such). The Biloxi Historical Society lists a number factories owned by several firms involving the DuKate family, including “Dunbars, Lopez, & Dukate Company“, in Alabama, Mississippi, and Louisiana. 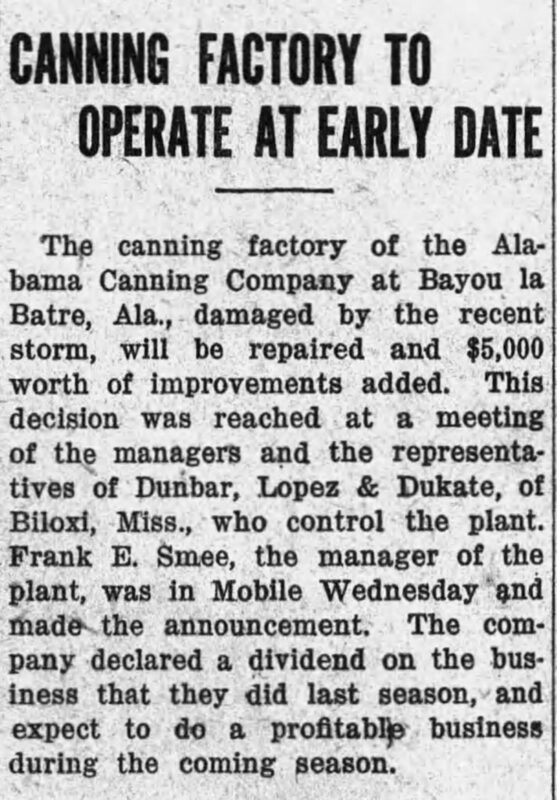 It appears that it was often called the “Alabama Canning Company” even when it was owned by DuKate. Julian Lee Rayford, writing in 1956, describes a world already long gone, including a “Big Factory” owned by “Dunn, Barr, and Ducate”. distinct contrast between the periods. After 1906, the factories lined the Bayou. 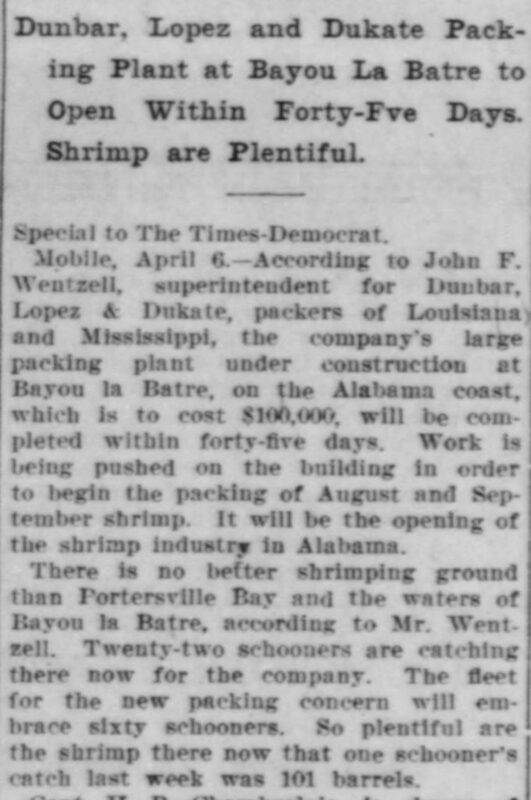 The John F. Wentzell mentioned here is probably related to Wintzell’s Oyster House founder J. Oliver Wintzell, as well as the Wintzell family of Bayou La Batre. The factory is described as packing shrimp. It is not clear if this was the same facility as the oyster plant shown in the photos, or a different plant also located in Bayou La Batre. I cannot find any information about the existence of the Alabama Canning Company earlier than this. It is possible it operated under a different name before DuKate took it over, if it actually existed before 1910. I can only find one other page about an explosion, the Find-A-Grave page for Robert Walter Cox who died on August 16, 1923 when an ammonia tank exploded in the ice plant of the cannery. It reads like a newspaper article, but there’s no citation and I cannot find the same story anywhere else. Death injury and heavy property damage resulted form a violent explosion at the ice pant of the Alabama Canning Company at Bayou la Batre Thursday night. Robert Cox, 40 years old, frieman at the plant was almost instantly killed and two other persons, Willie and Aime Castello, father and son, recieved serious injuries. The disaster occurred when an ammonia generator exploded, wrecking the one-story structure. The loud noise which accompanied the explosion attracted the attention of people throughout the community, many of whom hurried to the scene. Cox was discovered in a dying condition outside the boiler room a few minutes after the generator exploded. The younger Castello was huried to the roof of the building from which he was rescued by persons who rushed to the plant. Willie Castello, the father, is an engineer at the plant according to information received in Mobile. His son is tankman at the ice plant. Shortly after the accident a Mobile physicain was summoned to treat the injured. The small casualty list was apprently attributable to the fact that only a few employees were on duty whe the explosion occurred. Perhaps this explosion was too much for the Big Factory to come back from, and put them out of business. Perhaps the Pure Food and Child Labor laws had made the business unprofitable. Or maybe decreasing supply due to overfishing. Or a combination of all these things. By the time of this 1943 map, the railroad is abandoned, the spur track for the factory is already just a dirt road, and the there is no indication building where the factory would have been. In the 20 years from 1923 to 1943, all trace of the Old Factory has vanished into the sea and sand.